The most important thing about collecting coins is protecting them. Unless you are only going to collect slabbed coins (encapsulated by a grading service) or just keep them housed in the original US mint holders, you are going to have to house them yourself. Coin holders come in all shapes and sizes. The most common are the cardboard holders like the one pictured here. In terms of which coin holders to use, stay away from ones with PVC (Polyvinylchloride). PVC were applied on old plastic holders back in the 1970’s to make them more flexible, but was later found to damage coins and reduce their value. More recently, plastic have been free of PVC, but if your coin starts showing a green film or becomes corrosive, take it out immediately. If you decide to do a whole collection of one coin, move on to folders. 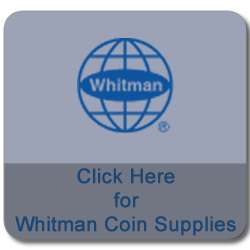 Back when I was a kid, I started collecting coins in the blue Whitman folders. 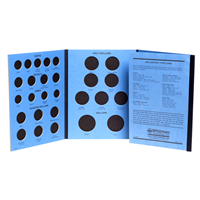 These are great for circulated coins. I started for four folders, the first two Lincoln Cent folders (1909 – 1974), the first Jefferson Nickel folder (1938 – 1961) and the first Roosevelt Dime folder (1946 – 1964). As time went on I added additional folders to my collection: Washington Quarters, Kennedy Half Dollars and Eisenhower Dollars. These folders were only meant for circulated coins, no proof coins or mint set only coins. If you wanted to collect uncirculated or proof coins, you moved on to albums. Albums provide a way to preserve your coins especially ones of higher grade or value. Be careful, some of the older albums back in the 1970’s and 1980’s because the plastic sliders had PVC. I had an old Whitman Album and after a year, I noticed some of the coins turning green. Modern albums should be safe. If you have a favorite way of preserving your coins, please comment about it below. You can get Coin Holders , Coin Folders , and Coin Albums on Ebay.